Are you planning to build a new home or office? Call your local Annapolis plumbers who specialize in new construction plumbing services. Contact Heidler, Inc. today at (410) 268-7191 to get started. If you are working with a new construction crew, make sure you have an experienced plumber on board who can get the job done correctly. Heidler, Inc. is your Annapolis plumber with the skills to complete new construction plumbing projects. We will help you design your property’s plumbing layout and make sure all pipes and fixtures are installed according to code. What needs to be considered during new construction plumbing? Heidler technicians are the ones to call if you are planning to build a new property. We will handle ny necessary permits before new work begins, including the paperwork needed to connect your property to the city’s water supply. We have experienced plumbing system designers on staff to help your create your new project, while ensuring the safety and functionality of your new property. In addition to new construction projects, plumbing permits are needed when remodeling work is required for your property. For example, you may be adding a new bathroom to your home or commercial property. We can file the necessary paperwork to make sure everything is carried out properly so you can avoid unnecessary problems. Are you building a new commercial property? Whether you are the owner of a chain of restaurants, or a small business owner who has recently taken over a space and would like to add a new touch, you will need a team of plumbing experts by your side to accomplish large-scale plumbing work. By making sure your building’s plumbing is up to code, you will avoid unnecessary fines and additional renovations to fix the problem. 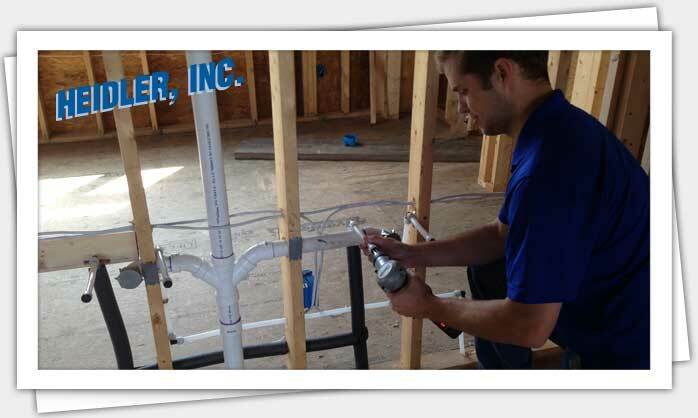 Trust Heidler, Inc. with your new construction plumbing needs. We will make sure your new property complies with local plumbing codes through quality installations. Call us today at (410) 268-7191 to discuss your options. You will receive upfront pricing so you know what to expect before any work begins.